Ixchel Beach Bar | ¡La Vida Es Rica! ~ Life is Delicious! Charlie’s tail wagging on my screen door this morning announced the pending dawn and a reminder that we hadn’t recently shared a walk and The Morning Show (the sun rising from the ocean of Puerto Morelos) –this day’s Show was magnificent! Slightly chilled through the morning damp, with sticky salt in my wind-styled hair , I was making my way toward home when I close my eyes to feel — more than hear — the gentle rustle of the whitecaps and the occasional whoosh of a pelican dive-bombing for breakfast. I open my eyes to visually drink in even more of this moment — a kiteboarder silhouetted against the recently dawned sun — lovers strolling, toes in the surf, fingertips lightly touching , with an occasional glance to the other, oblivious to all but themselves and the sea – Charlie dog frolicking with his beach-dog-buddies…. If nothing more, just this morning moment could be enough…. Ahhh….I’m drawn by the seductive scent of frying bacon and brewing coffee melding with salt and seaweed….How could one resist being led into such a delectable temptation? Ixchel Beach Bar with the lively chatter of Helene, the more-subdued Ben, and steaming coffee….Burly Newfoundland Kanya settles herself behind the counter. At a little after 7:00 am, Helene’s already dusted the bar, jiggled tables into sand, clothes-pinned plastic cloths to the tops, and trapped menus beneath the condiments. Locals chat. Tourists glance as they walk the beach, perhaps wondering if this rustic shack could possibly withstand today’s wind. A variety of dogs play tag around the tables, occasionally finding reason to joyfully leap into the waves…. The limited menu choices are exactly right for the capabilities of this jungle-pole constructed, extension-cord powered, magnificent “joint” – Eggs any style with toast and bacon or sausage, pancakes, French toast, yogurt with granola– each dish individually prepared with seasonal fruit. I’ve been diligently working my way through the menu. Today: The Duo – two eggs over-easy accompanied by the initial temptation — crackly bacon fried to the perfection point of not-quite overdone, along with whole-wheat toast and slices of watermelon, pineapple, and starfruit…. The breeze is a bit strong this day , and the hide-and-seek sun with clouds cause sunglasses and cover-up clothing to be on-again/off-again. Sand sticks to my sea-damp legs. Charlie vainly anticipates a dropped bite of something more savory than coffee…. This meal — the food, the setting, the people, the overall experience — could not possibly be more glorious…. As with most Puerto Morelos establishments, hours depend solely on the weather and mood of the proprietor. Don’t even think about reservations. In general – Ixchel Beach Bar is open every day with breakfast served 7:00 am to 10:30 or 11:00, followed by a delightful bar experience with beer, wine, mixed drinks and snacks until dusk. If it’s crowded, be prepared to wait. Bacon and sausage is generally ready, but everything else is prepared as it’s ordered. Stopping at Ixchel is the perfect complement to a morning stroll – To find it from town, remove your shoes and walk north on the beach past Hotel Ojo de Agua, Playa Sol, and mustard-colored Hotel Arrecifes — you’ll see this rustic shack on the other side of Ocean Homes…. Eggs, bacon or sausage, fruit, pancakes, French toast. Definitely a family-friendly and dog-friendly place, as children dig in the sand and locals with dogs congregate for morning coffee and conversation…. The Morning Show: a decadent way to start the day – the sunrise on the beach in Puerto Morelos is beyond compare. And add a stroll with Charley dog-Heaven on Earth. 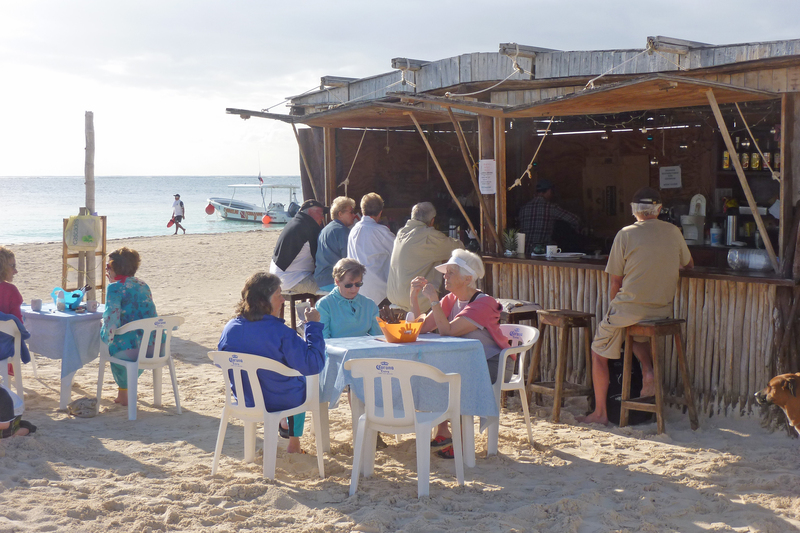 Ixchel Beach Bar is the height of beach dining – it is all you need and it adds the joy of wonderful local people. Mary, your blog makes me wish I was there every day. Your writing touches your reader through each of the senses and we are immediately transported to one of my favorite places on the planet. Ahhh…just BE. We just returned from a wonderful breakfast here. We had the pancakes and they were delightful–very different than I expected–more like crepes. The cook rolled them up, sprinkled with powedered sugar, put beautiful fruit on top, added crispy bacon, and yummy with just a bit of maple syrup. The view was outstanding too! WE CANT WAIT TO SAMPLE THE FARE.! 5 MORE WEEKS! THE HARD PART IS GOING TO BE COMMING HOME. THE WAY YOU WRITE MARY, THE POPULATION WILL DOUBLE BEFORE WE GET THERE. Hmmm… I can actually smell the sand and sea (in addition to the bacon!) Can’t wait to come experience it first hand. I’ll be checking out your blog and links from it regularly to get me psyched before my visit. On the technical side, would be nice if links to other places could open in a new window so I don’t lose my place on your blog. Thanks for sharing your experience! Your description of our morning ritual is perfect! Now that you have my email you can send me the photo of Sadie with her face full of sand. We do love the mornings at the beach bar.